Idea #1 for reopening: The mouth of the San Bernard continues to collect sand from a alongshore sediment transport from the east. 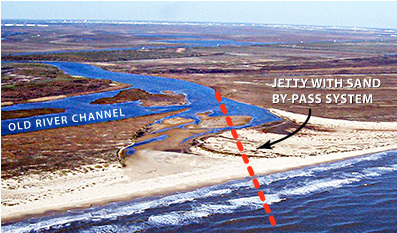 Building a jetty (dotted red line) will interupt this build-up but accumulation of sand will occur at the up drift side. A sand by-pass pipeline system under the channel would be needed to continually transport the sand to the down drift side.